Flowers are a way to commemorate life's most significant celebrations. From birthdays to weddings, they are essential to almost all family occasions. Funeral flowers continue to hold great importance to most funeral traditions and services today. Let LYDIA'S help you choose the perfect tribute to express your feelings for the departed. We are experienced in delivering to all funeral homes in Vincennes and the surrounding areas. If you are looking for standing funeral sprays in Vincennes, LYDIA'S can help. We specialize in funeral flowers and can create the perfect memorial for your final tribute. 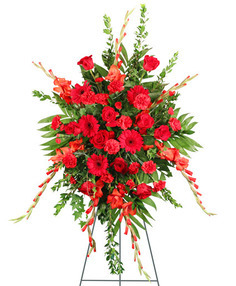 Order your floral standing spray online or call us at (877) 886-4763 for something more custom. For quality casket flowers in Vincennes, look no further than your neighborhood florist, LYDIA'S. We can create something to match the style and personality of your departed loved one. 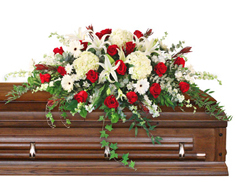 Give us a call at (877) 886-4763 or order your casket flowers online below. We also create memorial flowers for cremation services. Show your sympathy in Vincennes with the traditional gift of flowers. LYDIA'S specializes in all types of funeral flowers and can create something perfect to match your specific needs. Sympathy arrangements are the ideal choice for expressing your feelings to the family of a lost loved one. So shop our selection of sympathy flowers online or give us a call at (877) 886-4763 if you need more assistance.